As the nation grapples with pumped-up gas prices, car owners are turning to their favorite restaurants for a solution: recycled vegetable oil. Environmentalists have been using the fuel alternative for years as a way to cut back on sooty emissions, but as gas prices soar above $2 a gallon, they say their "veggie cars" are also a great way to save some cash. Every two weeks, Etta Kantor drives to a local Chinese restaurant to fuel her blue Volkswagen Jetta. She calls ahead and the owner knows to put aside a few buckets of used oil just for her. At home, Kantor uses a colander and a bag filter to remove water and any food particles. 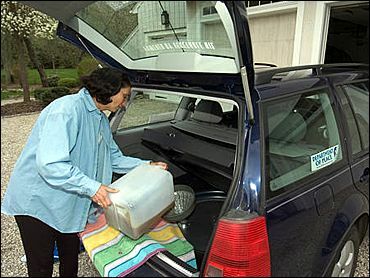 The vegetable oil is then poured into a 15-gallon tank that sits in the back of her Jetta, where a spare tire would usually be kept. With a touch of a button, located above the radio, Kantor can switch from diesel fuel to vegetable oil in seconds. "Oh, I zip around town, go fast on highways. It's not any different," said Kantor, 58, of Weston. Restaurants have to pay to get rid of their old vegetable oil and are happy to give it away for free. "It saves us a couple of dollars and it helps to save the environment a bit so I thought, 'Why not?'" said Shawn Reilly, a co-owner of Eli's On Whitney, a restaurant in Hamden. Reilly estimates that it costs between $40 and $60 a month to have the oil removed otherwise. The restaurant's only oil collector, Bridgeport resident Aaron Schlechter, says he picks up about 30 or 40 gallons twice a month from Eli's. He uses it to fuel his car for his 170-mile commute every day to his job as an environmental consultant in Staten Island, N.Y.
"The only way that I can assuage my guilt by driving this awful distance is by driving something that isn't consuming fossil fuels and has much more environmentally friendly emissions," Schlechter, 29, said. Vegetable oil is becoming such a rage that a Massachusetts company called Greasecar, is buying it in bulk from a distributor and selling it to local customers. It sells for 90 cents a gallon, said company founder Justin Carven. Since 2001, Greasecar has also been selling conversion kits, like the one in Kantor's car, that allow diesel cars to run on the recycled oil. The kits only work on diesel engines. About 200 kits were sold in the past year, Carven said. A standard conversion kit sells for $800 at Greasecar. "Once you install it, though, you are saving hundreds and hundreds of dollars," he said. "The product usually pays for itself within the first year." Using the conversion kit, the car must be started and stopped on diesel fuel. A separate fuel tank is installed to hold the vegetable oil. Once the car is running and the vegetable oil has heated up, it can be switched over to run on just the vegetable oil. The oil must be heated because it is thicker and tends to congeal in the cold weather, Carven said. Similarly, Liquid Solar in Ithaca, N.Y., has contracts with a few local restaurants to collect their used vegetable oil. And in Santa Rosa, Calif., a group of 50 people have formed a co-op to buy the oil in bulk from a local manufacturer and then filter it for their own use. Although the Environmental Protection Agency has given a stamp of approval for vegetable-based biodiesel, it hasn't approved any recycled oil for sale, said Christine Sansevero, an environmental engineer for EPA. "You just don't know what's in that oil," she said. "There could be metals, other chemicals that, when burned, could create something you didn't intend to burn. It could also be fine, but it's an unknown." Biodiesel is a fuel derived from plant oil or animal fat, Sansevero said. It can be used in pure form but it is often blended with regular diesel. The most common form is B20 — a blend of 20 percent biodiesel and 80 percent petroleum diesel. Veggie car owners agree that biodiesel is another renewable fuel source, but say it isn't as cost effective or eco-friendly. Pure biodiesel costs about $1 more per gallon than diesel, Sansevero said. B20 costs about 20 cents more per gallon than diesel, she said. The trend is catching on, especially for those who have a distance to drive. The Healing Waters Band had a Greasecar conversion kit installed in its bus for a recent seven-week tour across the country. The band used a blended biodiesel mix to start and stop the engine, and vegetable oil for the rest. The band left its hometown of San Diego on a full tank of vegetable oil and then filled up again at a Chinese restaurant in Missouri before buying 500 gallons during a stop at Greasecar in Massachusetts. "We only spent $200 that would have normally cost us about $1,200, and we probably could have done it all for free if we kept stopping (at restaurants)," said Tony Thorpe, 34, a bassist and vocalist for the band. In Connecticut, Kantor is hoping to start her own small distribution center so she and others won't have to rely so heavily on restaurants for fuel. "You know that expression, 'If you build it, they will come.' Well, if we make it accessible, people will use it," Kantor said.